Kansas NEA, NEA, and partner organizations offer many different types of grants scholarships and awards for members. Check out some of the opportunities that follow and then apply! CLICK HERE to download the grant application packet. The Kansas NEA budget provides funding for grants to groups within the Association working to further our strategic focus as identified in the KNEA Operational Plan. The funds are not intended for routine programs but are intended for new and innovative strategic activities that groups cannot fund on their own. Generally, activities that will be funded are planned and approved before they occur. ELIGIBILITY: Locals, UniServ districts, committees, or consortiums of two or more membership units are eligible to apply for grants addressing KNEA’s priorities. Programs that already receive funding from KNEA in other areas of the budget should utilize those other line items as their primary source for project funding and utilize grants to provide additional resources for projects that exceed already funded amounts (e.g., Political Action may utilize KPAC funding for some projects, UniServ districts should utilize their Program and Training budget before requesting grant funding). AVAILABLE FUNDING: There is $9,000 budgeted for 2017-2018 Strategic Focus Grants. Any amount leftover from the previous year will be carried over, adding to the amount available. These funds are allocated over the course of the year and serve all locals, committees, and UniServs. The desire to serve several varied groups’ places constraints on the total funds available for any one project. APPLICATION PROCESS: Complete an application following the guidelines provided with this overview. Grants may be submitted at any time, via mail or e-mail. The selection committee meets to review proposals received. Applicants will be informed of the status of their applications within two weeks of the selection meeting at which it is considered. Groups may appeal decisions of the selection committee to the KNEA Executive Director in writing within 30 days of notification of the grant’s response. CLICK HERE to download the combined scholarship application. *Scholarship applications must be postmarked by February 1, 2019. The KNEA Sherri Yourdon Memorial Scholarship is a $1,000.00 award designed for a KNEA member who is a single mother pursuing an advanced degree. Preference will be given to candidates pursuing degrees in education or related fields. A $1,000 grant to a member of the KNEA Student Program during the time spent student teaching. The Rodney VanZandt Scholarship was established in September 1998 in memory of his work at KNEA. This scholarship is a $400 award available for a nontraditional student member of KNEA. The C.O. Wright Scholarship was established in August 1982 to commemorate his work for KSTA. The $250 award is designated for a KNEA Student Member. The George Frey scholarship was established in November 1981. 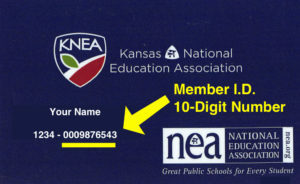 It is a $200 award designated for a KNEA Student Member. The Epperson-Peters Award is given to the KNEA member or local association whose individual or collective efforts best exemplify the ideals of teacher efficacy. This award recognizes those whose continuing and extraordinary efforts bring to life the principles of protecting individual and collective employment, and human and civil rights in the teaching community. The activities shall have made a significant statewide impact on the education community. The KNEA Representative Assembly created the Friend of Education Award as an annual recognition of a person or organization whose leadership, acts, and support have contributed to the improvement of public education on a statewide level. The HCR Award is given to an individual, a school, an educational association and/or organization working in the field of Human and Civil Rights within the last five years. The KNEA Membership Award will be awarded to the UniServ District with the greatest percentage of membership increase based on January 15 membership figures. The Wootton Political Achievement Award is given to a KNEA member, UniServ District, local association or political action committee whose activities further the educational opportunities for KNEA members and the students of Kansas, and has a significant impact on the education community. This award recognizes outstanding service in the field of political action. The KNEA ESP Award is established to recognize contributions by an educational support professional member for his/her efforts to advance the KNEA and ESP activities within the Association. A certificate will be awarded the UniServ District with the greatest percentage of its members contributing to the NEA Fund for Children and Public Education through Electronic Funds Transfer. The Jack Williamson Service Award is given to a KNEA member, KNEA staff, UniServ District or Local Association who goes above and beyond in service to public education. This award recognizes outstanding service on multiple levels of public education. NEA Foundation offers Teacher Grants for Public School Educators through global resources, learning and leadership grants, student achievement grants and a host of others.